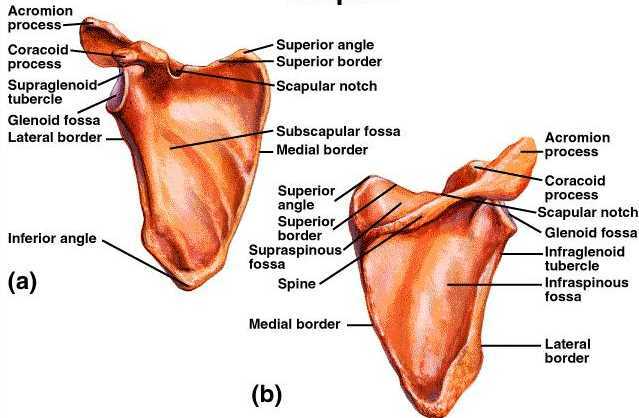 The scapula is the technical name for the shoulder blade. It is a flat, triangular bone that lies over the back of the upper ribs. The rear surface can be felt under the skin. It serves as an attachment for some of the muscles and tendons of the arm, neck, chest and back and aids in the movements of the arm and shoulder. It is well padded with muscle so that great force is required to fracture it. The back surface of each scapula is divided into unequal portions by a spine. This spine leads to a head, which bears two processes-the acromion process that forms the tip of the shoulder and a coracoid process that curves forward and down below the clavicle (collarbone). The acromion process joins a clavicle and provides attachments for muscles of the arm and chest muscles. The acromion is a bony prominence at the top of the shoulder blade. On the head of the scapula, between the processes mentioned above, is a depression called the glenoid cavity. It joins with the head of the upper arm bone (humerus). The capsular ligament of the shoulder is surrounded and reinforced by muscles, tendons, and ligaments, which are largely responsible for keeping the adjoining parts together. A capsule is a membrane or sac enclosing a body part, usually a joint. The joint capsule of the shoulder is attached along the outside ring of the genoid cavity and the anatomical neck of the humerus. Although it completely covers the joint, the capsule is very loose and by itself would be unable to keep the bones of the joint in close contact without the aid of the fibers around it. The coracoclavicular ligament connects the coracoid process to the clavicle (collarbone). The coracohumeral ligament is composed of a broad band of connective tissue that connects the coracoid process of the scapula (shoulder blade) to the greater tubercle of the humerus (upper arm bone). Its function is to strengthen the superior portion of the joint capsule.